On The Rainbow Boa.co.uk you can find information on keeping Rainbow Boas. 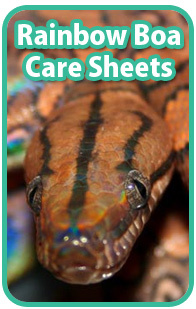 Whether you have a Columbian, Brazilian or Argentine Rainbow Boa we have all the information you need on general keeping and care. In The Rainbow Boa Forum you can chat/discuss with other forum users about your Rainbow Boa experience it's a good place to look for help if you have any questions regarding your snake. You can also post photos, links and more. The Rainbow Boa is a website built with Rainbow Boa snake keepers in mind. 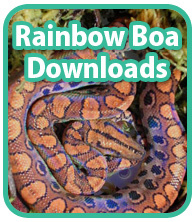 The Rainbow Boa.co.uk was set up with the aim of helping other Rainbow Boa enthusiasts and people thinking about keeping a Rainbow Boas as a pet. The Rainbow Boa.co.uk is a non-profit website which has no annoying popup's. TheRainbowBoa.co.uk is part of TheReptilian.co.uk group, a network of reptile and amphibian related websites giving care information on a host of exotic pets. Introductory facts about Rainbow Boas. Rainbow boas are native to South America and can mainly be found in tropical and humid rainforests. There are 12 recognised sub-species of Rainbow Boa, which are defined by both their patternings and the location of their natural habitats. Rainbow Boas are so called because their bodies have an iridescent sheen that gleams with a rainbow effect, similar to the spectrum of colours that we see when oil is on water. This rainbow effect is caused by the refraction of light as the Rainbow Boa’s scales act like mini prisms, due to tiny microscopic ridges that the eye cannot see. This iridescent sheen also makes Rainbow Boas one of the most visually attractive snakes in both the pet trade and the world. Rainbow Boas are part of the family boidae, which is part of the order Squamata, which includes all the scaled reptiles including all snakes and lizards. In evolutionary terms, boas are a primitive species that have not evolved for many thousands of years. Many boas, including Rainbow Boas, still have spurs on either side of the cloaca, which are said to be evidence of the pre-existence of limbs. Rainbow Boas are sometimes referred to as Slender Boas, as they are not as heavy-bodied as most of the other members of the family Boidae. Rainbow Boas are constrictors, which mean they kill their prey by coiling around it and stopping the air flow. Rainbow boas prefer to hunt at night time and their usual prey includes rodents, birds and small mammals. Rainbow Boas are highly sort after within the pet trade, with Brazilian Rainbow Boas and Columbian Rainbow Boas being the most popular Rainbow Boas in captivity. If you would like to send your Rainbow Boa photographs for us to add to the Rainbow Boa Photos page please email your best pictures to photos@theRainbowBoa.co.uk along with your name and your snakes name.